Medicare Next Generation accountable care organizations produced $129 million in savings for the CMS in 2017 while earning an average of $3.3 million each in bonuses for beating cost targets and meeting quality benchmarks, the CMS reported Friday. Of the 44 participants, 32 scored bonuses for 2017, compared with 11 of 18 participants, or 61%, in 2016, the program's first year. Next Generation ACOs saved Medicare $62 million that year. The ACOs served 1.2 million Medicare beneficiaries in 2017. Next Generation is the CMS' more rigorous financial-risk-sharing ACO demonstration, which is scheduled to last at least five years. HHS Secretary Alex Azar and CMS Administrator Seema Verma say they want to accelerate the shift to value-based payment, and the Next Generation program is an important part of that push. Fifty-one ACOs are participating in 2018. "This is promising in that it shows Medicare is saving money while the majority of participants are also getting bonuses," said David Muhlestein, chief research officer at Leavitt Partners, who tracks the CMS ACO programs. The top performers in terms of percentage savings from the CMS-set benchmark were UniPhy ACO at 12.6%, Northwest Momentum Health Partners at 8.2%, and Bellin Health's Physician Partners at 7.7%. Those suffering the biggest percentage losses, which they had to return in full to the CMS, were Optum Accountable Care at -4.8%, Hill Physicians Medical Group at -4.7%, and Fairview Health Services at -3.3%. The Next Generation ACOs receiving the largest total bonuses were UT Southwestern Accountable Care Network, which pocketed $29.2 million, Deaconness Care Integration, which collected $16.1 million, and Atrius Health, which earned $15 million. Total bonuses for the 32 ACOs receiving them were $200.5 million. Those experiencing the biggest total losses were Optum Accountable Care at $14.4 million, Hill Physicians Medical Group at $9.3 million, and National ACO at $6.5 million. 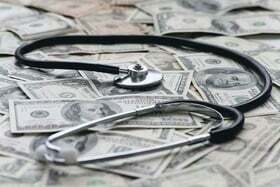 Total losses for the 12 ACOs losing money were $57.4 million. Experts say ACOs succeed by getting doctors, hospitals and other providers to work together closely to ensure that patients, especially those with costly chronic conditions, get strong primary and preventive care to keep them out of the hospital and emergency room and trimming unnecessary post-acute care. The bonuses they receive for doing this effectively can offset the revenue losses hospitals face from reduced admissions and emergency department use. Next Generation ACOs accept greater financial risk-sharing than Medicare Shared Savings ACOs, a program in which most organizations have faced no downside risk. On Friday, the CMS finalized a new rule that requires Shared Savings ACOs to take on downside financial risk sooner or exit the program. The results of the Shared Savings ACO program have been more marginal than the Next Generation results, with only about a quarter of Shared Savings ACOs receiving bonus payments for hitting cost and quality targets in 2017. Muhlestein says it's possible that based on the positive 2017 results, the CMS will consider moving the Next Generation model from a Center for Medicare and Medicaid Innovation demonstration to the mainstream Medicare program and inviting more provider organizations to sign up. But seven ACOs left the Next Generation program earlier this year, with some withdrawing because of changes made to the program's design, including the risk-adjustment model. Twenty-nine Next Generation ACOs formed a coalition in September to advocate for CMS policies that enable ACOs to maintain long-term viability. It's unclear whether and how the CMMI's Medicare ACO programs, as well as its bundled-payment and other value-based demonstrations, would continue if the Dec. 14 ruling by a Texas federal judge to strike down the entire Affordable Care Act is upheld on appeal. That's because the 2010 healthcare law authorizes and funds the Innovation Center.